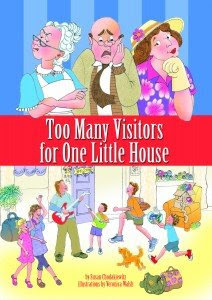 Thanks for reviewing Too Many Visitors for One Little House! Glad to hear your daughter enjoyed it! We almost had a "RERUN" of this story when all the visitors decided to have a "sequel" event at our house this July 4th! This time only 16 slept over (last time it was 23)and for ONLY 4 days. -- no pipes overflowed this time! We did have fun though. Founder, Booksicals- Encouraging reading through the arts.